The 14th Siberian Conference SIBCON–2019 aims to offer opportunities to learn and to share information on the latest advances in communications, electron devices, and control systems. It will be held in Tomsk, Russian Federation, on April 18–20, 2019 based on Tomsk State University of Control Systems and Radioelectronics. The conference is organized by the IEEE units in Siberia and National Instruments Rus R&D on a regular basis in order to promote interdisciplinary discussion and interaction among scientists and engineers with an emphasis on the IEEE membership. 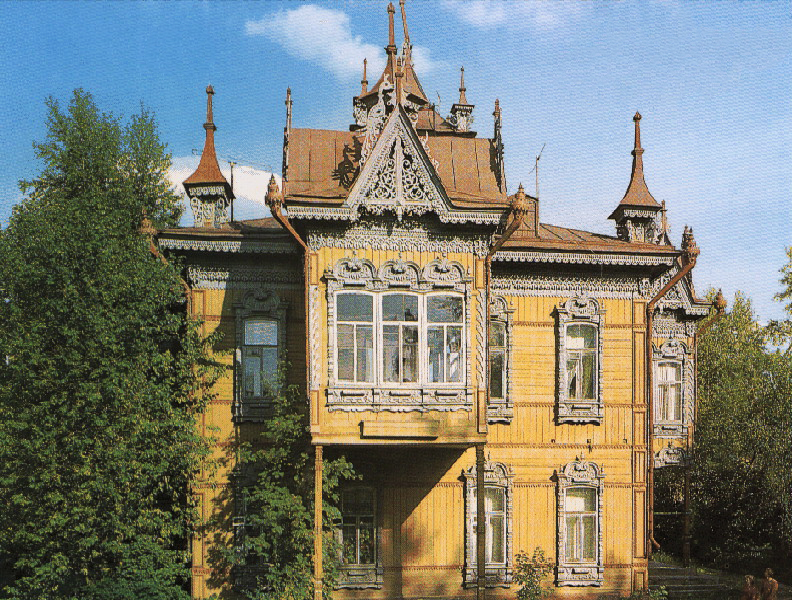 While the scientific program is expected to create stimulating professional interaction, the magic of Tomsk, hot spring atmosphere and wealth of historic wooden architecture promise a pleasant and memorable stay. The SIBCON International Conference is a forum to bring together business people, researchers, scientists, and industry professionals to discuss innovative ideas and diverse topics on next generation of comms technologies and control. Using this forum, researchers and practitioners can exchange issues, challenges, and new technologies and solutions. The SIBCON aims at attracting both researchers from academic and industrial institutions and practitioners from industry. Researchers, practitioners and distinguished speakers are invited to submit a paper or to make proposals of original research speeches addressing business and technical issues, challenges, solutions, and technologies in building applications, complete solutions and services. All papers will be peer-reviewed by the members of the Scientific Program Committee. The Fundamental Problems of Communication and Control Theory. Computer Measurement Technologies, Sensors and Systems. The conference will include plenary sessions (with invited speakers), parallel thematic sessions (with oral presentations), and a social program. Prospective authors are invited to submit papers of their original research contributions describing new results, original ideas, and applications on relevant topics. The abstracts should be sent in English, via webform sibcon.tusur.ru, in PDF file, length of 4-6 A4 (21x29.7 cm) pages (with margins at 2.5 cm, 10-point Times New Roman or similar fonts, and single spaced). The IEEE template should be used. The manuscripts should contain the following information: paper title, keywords, state-of-the-art in the field of interest, problem statement and objective, description of the contribution (novelty, research methodology), results achieved and their further development and applicability, references, author(s) data (name, title, affiliation, full mailing address, phone and fax numbers, e-mail address), and corresponding author name. The International Program Committee will make the selection of papers. Papers will be reviewed for the technical merit and content. Only original, unpublished contributions will be considered. The conference proceedings will be published in English, containing all conference manuscripts, and will be distributed among the conference participants, leading libraries, and international scientific centers. The Proceedings are indexed in IEEE Xplore database. Notifications of paper acceptance and the preliminary program will be sent to the first author in January 2019.
International Symposium «Computer Measuring Technologies» and exhibition will be held in conjunction with SIBCON. The Symposium is organized by National Instruments Rus R&D, which purpose is discussion of issues of introduction of innovative technologies for engineering, design, automation, modeling, and research experiment. You are cordially invited to participate for free. The registration fee – $280 for IEEE members and $380 for other participants needs be paid only upon receipt of the official invitation letter, which will be sent to the first author by mail. Registration fee includes a visa support, one copy of the Proceedings, a get-together party, banquet, cultural/technical visits, and coffee breaks. The working language is English. No simultaneous translation will be provided. All materials concerning the conference should be written in English. SIBCON looking for dynamic speakers, who want to share new and exciting experiences associate with the Conference topics, new vision, and address the challenges facing today's technology users and application may cover their needs. Organizing Committee invites submissions for Keynote Sessions on all topics of potential interest to the conference attendees. Keynote Sessions proposals must clearly identify the intended audience, speaker's background on relevant subject. If you are interesting in presenting Keynote during SIBCON Conference, please send the Keynote proposal to the Conference Technical Program Chair. The Organizing Committee accepts proposals for short courses related to the conference topics until November 18, 2018. The tutorial program is intended to provide all attendees with an opportunity to expand their Conference experience, and as a result help to meet their expectations. Since this year SIBCON makes emphasis to Robots, we encourage appropriate topics besides others within conference scope. The SIBCON invites submissions for tutorial proposals on all topics of potential interest to the conference attendees. Tutorial proposals must clearly identify the intended audience, speaker's background on relevant subject and the main learning outcomes. The intended length of the tutorial is 1.5–3 hours, but should also be indicated in proposal. If you are interesting in presenting tutorial during the Conference, please email us. You may be required to apply for entry Russian visa in advance. Visa application can take up to three-four month to be processed. Please contact the conference organizers in time to get an official invitation. XIX All-Russian Contest SIBINFO is a special session of the Conference. The Contest participants may take part in SIBCON sessions for free. All papers will be published in the Conference Proceedings. For including the paper in the IEEE Xplore participant must receive registration at SIBCON. Registration and paper submission are closed. 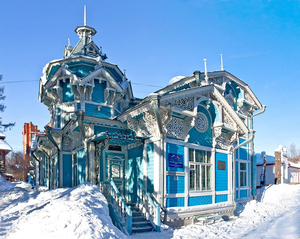 TOMSK, one of the oldest Siberian towns, was founded in 1604 on the high upper bank of the Tom River. It is a historical city, with a present population of 620,000. In the past it was the fortress and the town of people in state service, the provincial center of the vast Siberian land, and a merchant town. Over the course of two centuries the Moscow-Siberian road has affected the formation of the original architectural-historical look of Tomsk. The quiet side-streets of our town capture you with the mysterious music of ancient wood and stone, with the delicate ligature of carved decor. Since its foundation in the 17th century, the city has been growing and developing, moving forward. 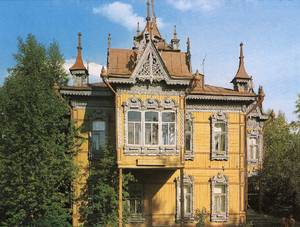 Tomsk has not lost its unique features and traditions in the process of its development. As any historic city, our homeland is rich with interesting people and events, it harbors a lot of mysteries and small secrets. In other words, we have many things to show and to tell. Tomsk is one of the most beautiful cities in Russia. 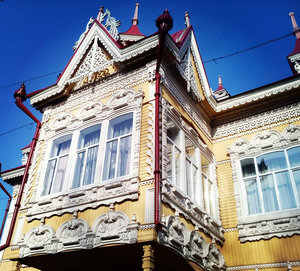 Houses decorated with wooden lace, gold-plated church domes – the beauty of the streets earns for Tomsk its reputation as a historical center of Siberia. However, despite its venerable age, Tomsk appears youthful thanks to the students and young scientists. 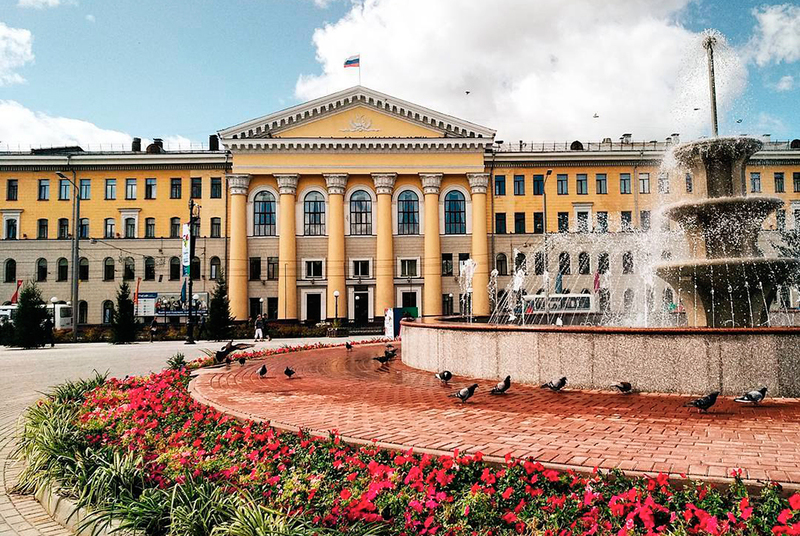 Nowadays, there are ten academic institutes and six universities in Tomsk. Modern Tomsk is a large, generally acknowledged Russian educational and research center. Tomsk takes first place in Russia for the number of students and scholars. Higher education beyond the Urals started in Tomsk. Tomsk-based experts have made a valuable contribution in the advancement of electronics, precision mechanical engineering and metal working, up-to-date building industries, and automatization production. As one of the oldest cities in Siberia, Tomsk offers many architectural monuments to the past, as well as distinctive wooden houses decorated by wood-carving. There exist numerous historical, cultural and architectural landmarks drawing visitor's attention. Like a magnet it attracts the best people of each epoch. 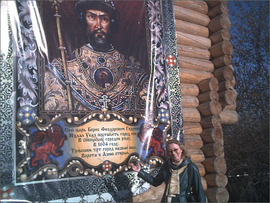 More about Tomsk may be learned at Web site tomskhistory.lib.tomsk.ru where virtual excursion proposed. We sincerely hope SIBCON help you feel the special atmosphere of our home city, get acquainted with its sights, places of historical interest, and learn about the oldest city in Siberia. We believe, you will share our love for Tomsk. 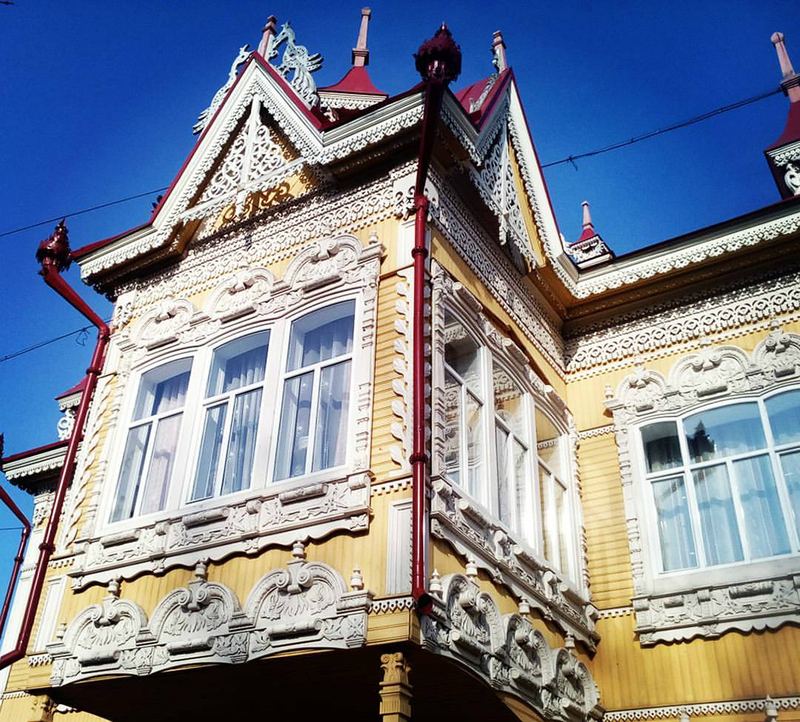 Discover Tomsk, a modern renaissance city where history and wooden houses meets innovation and culture. The venue of SIBCON is Tomsk State University of Control Systems and Radioelectronics. TUSUR is the modern, dynamically developing university, one of leaders in system of Russian high education on electronics. 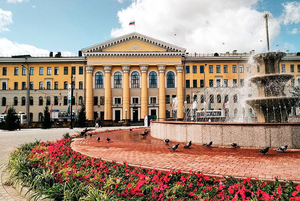 TUSUR is included into QS World University Rankings EECA as 26 leading universities of the Russian universities. There are 12 faculties and 34 departments in TUSUR. Training is carried out by 60 programs. There are more than 12000 BS students, MS and Ph.D students. TUSUR design about 80 % scientific and research results in Tomsk Region. More detailed information about TUSUR please find at tusur.ru. All registration information and hotel reservation forms, instructions for the preparation camera-ready paper etc. will be available in the second announcement at the Web.